Before the Internet, collectors had few options to sell their unwanted cards. Brick and mortar shops would only offer a fraction of a card's value. Setting up at a weekend card show was, and still is, a commitment in time and money. Enter eBay. Since the late 1990s, its worldwide audience, simple listing tools and a relatively low start-up cost have given collectors a lot more options for selling their cards. So how does one actually list trading cards on eBay? What are some of the tips, tricks, and best practices used by top-rated sellers? The purpose of this article is to answer some frequently asked questions and walk you through the listing process, step-by-step. 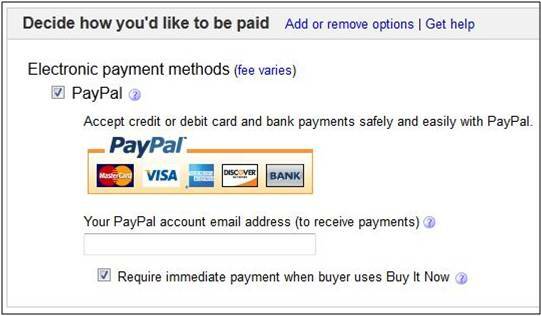 It is assumed that you already have an eBay and PayPal account. However, if you don’t, you can use the following links to complete the registration process for each. and upgrade or register for a PayPal Premiere Account. Whether you plan on selling trading cards on eBay to fund other hobby purchases or to serve as a secondary form of income, it is wise to keep track of expenses from the beginning. They may have tax implications down the road. Some of those expenses will be shipping supplies and card protection. It can be beneficial to stock up on these items in bulk before you start selling so that you aren't scrambling or recycling supplies once you close your first card sales. The following list will get you started and can be purchased conveniently online at a place like Amazon or through a combination of an office supply store and a hobby shop. It's good to have a few different size bubble mailers on-hand to accommodate multi-card purchases, cards with abnormal dimensions, graded cards, etc. The 4 x 6 bubble mailers are smaller and a bit cheaper and less bulky, making them another popular option for shipping cards. At this point, you have your eBay seller account set-up, your PayPal Premiere account set-up and verified, your checking account set-up, linked and funded, and you are stockpiled on shipping supplies and card protection. It’s time to start selling! eBay offers several options for selling trading cards: traditional auctions, Buy It Now sales and eBay stores. While setting up an eBay store may be practical, we recommend getting your feet wet with the more traditional auctions and Buy It Now listings. After you've been selling for a while and are more familiar with using the site, then you may want to shift into an eBay store. One of the first and most important things to do when you start listing your cards is to know exactly what card you are listing. This applies to both the type of card and the card’s condition. Once you have determined these aspects, it is time to create your listing. 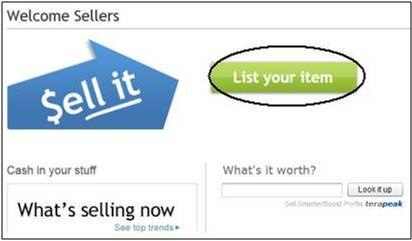 Start by signing in and clicking on the "Sell" link that is found at the top of the page. 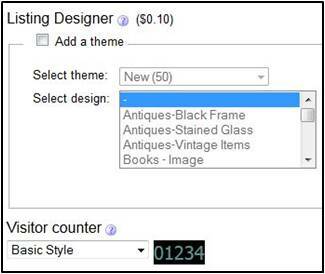 Sign in again if prompted and select the "List Your Item" button. 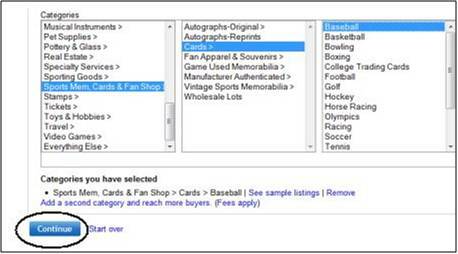 Scroll down and select the "Sports Mem, Cards & Fan Shop" category. On the next drop down select "Cards." Finally, select the proper sport. At the bottom, select "Continue." To help write a good title, take a quick glance at existing auctions. The most common elements are probably what is being searched as well. You may miss out on potential bidders by using abbreviations, which could cut into how much your cards sell for. Also, keep in mind the often ambiguous nature of memorabilia and relic cards. If the card back disclaimer doesn't specifically say "game-used" just use the term jersey, ball, shoe, or whatever the item is. You protect yourself from a buyer claiming you sold them a card as being game-used when it actually isn't. A secondary subtitle is available but the fee usually doesn't justify its inclusion. Select the condition from the drop-down menu. Most cards pulled directly from packs should be described as "Like New." 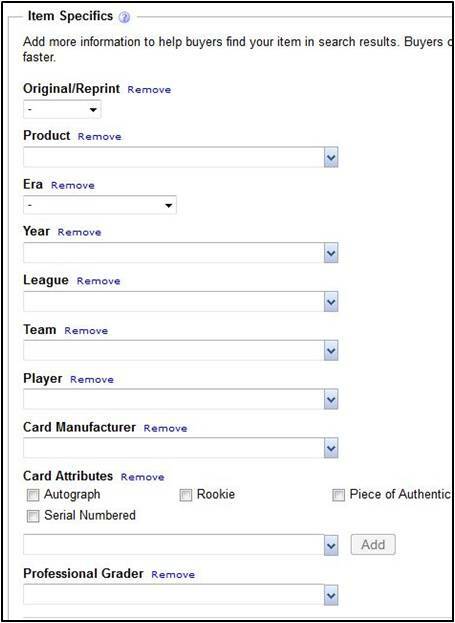 In the next section of the "Create Listing Page," you will be selecting item specifics such as the team name, if the card is graded, and, if so, by what company. Add a picture to your listing by clicking "Add Pictures" and following the directions on the next screen. Basically, you will be selecting a picture you have saved to your computer of the card. It cannot be stressed enough how important photos are. You have heard the phrase, "a picture is worth a thousand words." This definitely holds true in the case of buying and selling trading cards on eBay. The preferred method is to use a scanner as compared to a camera. It's easier and results in a better image. Scan one card at a time OR if scanning multiple cards, which can be done nine-up in a vertical format or eight-up in horizontal format, magnify the saved image and then crop and save the individual cards. Do not add a picture of multiple cards referred to as a "gang scan" to your listing. This can easily confuse potential bidders and possibly mislead them into thinking they’re buying multiple cards. To build trust with your bidders, do not crop your image to the edge of the card. Leave a bit of space to show you are not hiding any corner dings or chipped edges. Do not Photoshop, edit, or crop the card in a way that enhances the card's condition. This is a dishonest act and will be quickly picked up on by buyers. One picture is typically enough unless the card is an ungraded vintage card and you are trying to highlight the condition. In that case, you may want to include separate pictures of corners or one of the card's back. Use the description space (pictured below) to add any other details about the item and to reiterate what the auction listing is for. This is easily done by copying and pasting your title and adding information from there that didn’t fit such as the card number, whether an autograph is signed "on-card," if the memorabilia piece is a multi-color patch, etc. It is also wise to use collecting terms to state the card's condition. You can also state in this section what the shipping and handling charges are. 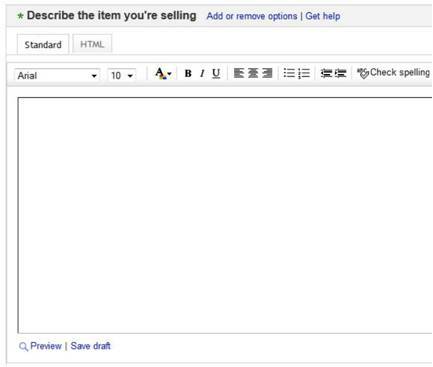 Here is a more detailed look at writing eBay descriptions. Ignore the next two sections, "Listing Designer" and "Visitor Count." These aren’t necessary for the purposes of selling in the sports trading card category. In the next few sections, you will select whether to list the item as an auction, a fixed priced, or a combination of both. As well, we will guide you through other details related to pricing, quantity and duration. However, first we need to find out the current value for your card. At this point, it is a good idea to bring up a second browser window and copy and paste your title into a new eBay search. Here you can see what identical or similar cards are selling for. You can take it one step further and look at recently completed auctions to get a real-time price range for the particular card you are selling. By clicking on the "Advanced" link next to the search button, this will pull up an additional screen where you can look at the aforementioned "Completed Listings" data by selecting the box accordingly and then clicking "Search." The resulting screen will give you details for up to 90 days worth of completed listings. This will allow you to better decide what price to list your card for. It can else help you set reasonable opening bids and reserve prices. Completed listings can also help you barter with an offers received through the "Best Offer" option. Sold items with bids are shown in green and unsold items are red. Carefully check the listing to make sure it matches the card you are selling. It is also worth noting that the search page shows Buy It Now prices. However, when you click on the item, the listing shows the realized bid. The difference between the two can be considerable so it is worth clicking on the actual item when researching with Buy It Now items. Now go back to the "Create Listing Page." As you can see above, there are two tabs to select from. The default is "Online Auction" with a Buy It Now option. The other is for the "Fixed Price" format, which we will come back to in a moment. Using the pricing data you discovered earlier, you can now select a starting bid, Buy It Now price, and reserve price. The only one that is required is the starting price. In this section, you will also say how many cards you have for sale and the duration of the listing. Seven-day listings are the default. Listing an auction with a large initial price will cost you increased insertion fees and deter prospective bidders. If the items detailed in the recently completed history have a final value within a range of $20 dollars, it’s fair to assume that is where your item will finish as well, assuming all things are equal. By starting with a bid of just $0.99 you will attract bidders, and save money. It might also be wise to determine the mean value for recent sales and place a Buy It Now price on the item equal to that value. If there is a wide gap between the lowest and highest price paid for the item, you may consider putting a Reserve Price on the auction. Keep in mind, collectors tend to shy away from auctions with reserve prices. When it comes to picking a listing’s duration and listing type, there is no clear-cut science as different sellers do different things. Special circumstances can change what the best plan might be. Some people swear that listing on a Thursday and running the auction for ten days is the best formula. The reason is that the item is live for two weekends, a period of higher documented eBay browsing. 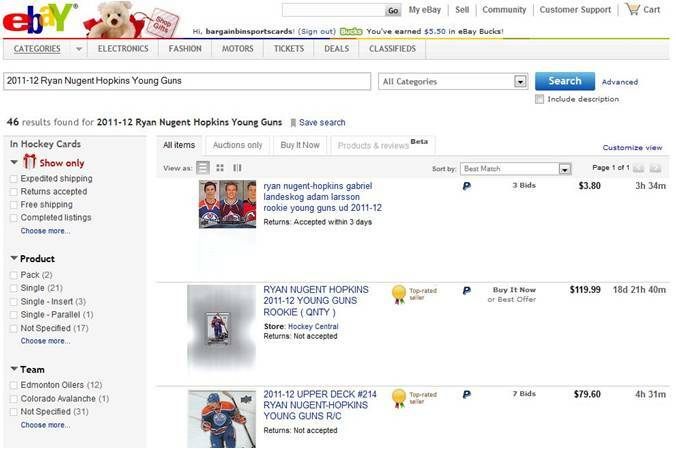 This allows the maximum number of potential bidders to view the item. Other people will advise that the best time to list your items is when you actually have the time to do so. Do what works best for your schedule. Still others say that with a high-end card, rare, or an exceptionally conditioned vintage card, that a short duration may work best. These items are often on people’s saved watch lists and will pay right away with a Buy It Now format. Other examples of when a short listing may be best is when a player breaks a record, unexpectedly makes the Hall of Fame, wins an award or other has a career- or life-changing event. In these circumstances, the "strike while the iron's hot" mentality often kicks in with collectors. 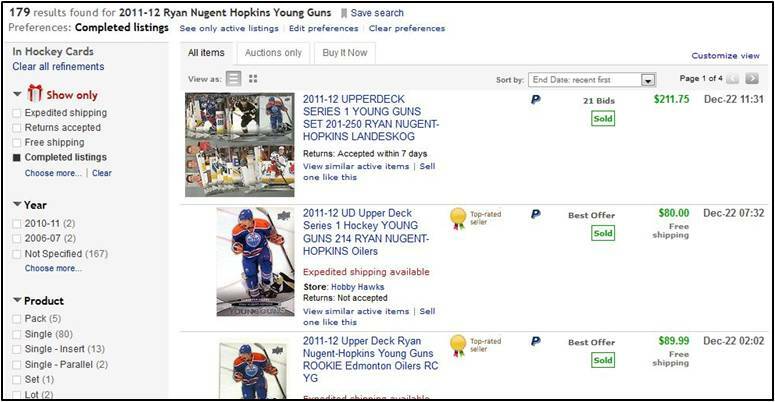 Until you get a better feel for the market and how collectors and bidders react to different aspects of the hobby, use the seven-day format, a low starting bid, no reserve, and a Buy It Now option. Below is the tab for a "Fixed-Price" listing referenced earlier. Here you have the option of setting and establishing rules to automatically reject or accept offers at specified amounts. 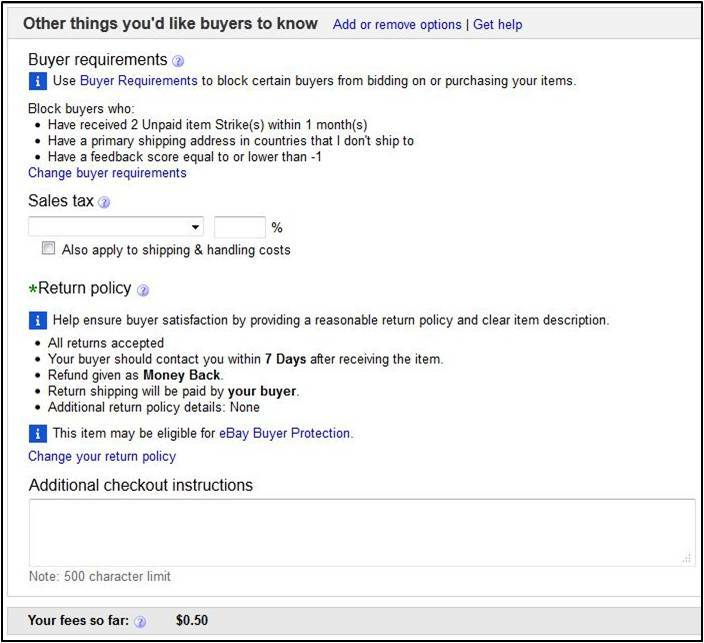 The next step is to select method of payments, which is a bit of a misnomer because eBay only facilitates payments through PayPal. Here you input the email address associated with your PayPal account. You can also specify if immediate payment is required for Buy It Now items. This is always a good idea as it can discourage unscrupulous sellers from buying your item while they are selling theirs and essentially holding it in limbo. As a seller, you can’t leave negative feedback against a buyer. Requiring immediate payment protects you. The next part of the listing process is to complete the shipping information section. You need to first decide if you will ship internationally. While this option obviously expands your potential market considerably, it also comes with inherent risks of dealing with foreign carriers when the parcel leaves the possession of USPS. When you first start as an eBay seller it is recommended to keep your market limited to the United States and its territories. However, for items that have specific appeal to international markets, opening bidding up may be essential. Be clear about your shipping options to international bidders and you may find higher bids, even if shipping prices are higher than you’d like. As a seller, you need protection. Bidders also like to be protected and many international buyers understand this. 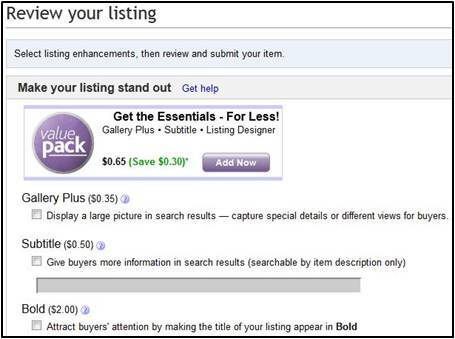 eBay discourages sellers from attempting to recoup selling fees within shipping and handling charges. However, they do allow a small, reasonable handling charge where you can offset a small part of those fees. While $2.95 for a single card may initially seem excessive, it is actually a fair value. The USPS postage cost including Delivery Confirmation alone is $1.75. However, much like any other business, you have built-in overhead. Not in the form of rent, utilities, and payroll but shipping materials, card protection, eBay and PayPal fees. 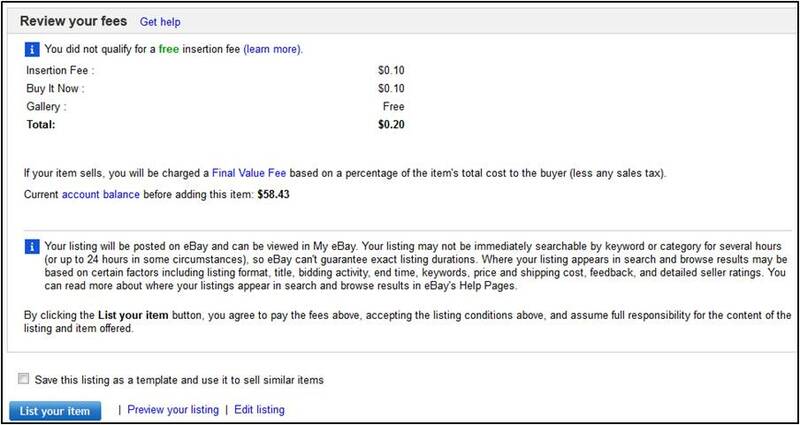 eBay charges an insertion fee, a fee for Buy it Now, a final value fee on the item and a final value fee on shipping and handling. When you account for the fact that every card you sell is going to use a bubble mailer, packaging tape, paper and toner for the label, a penny sleeve, top loader and team bag, it seems realistic to add $1.20 for all these other associated selling costs. However, if you are selling a card that is going to sell for over a hundred dollars anyway, it might be excessive and seen as greedy to charge for shipping at all. The choice is yours. You will have to decide what's best for you and your personal situation. In the screen capture above you will also see an option to create rules for combined shipping. This allows you to discount shipping for a bidder who has purchased more than one card. You can also specify the handling time. This is the turnaround time from when the item is paid for to when it ships. You should allow yourself a 48-hour window to account for the unexpected (late night at work, sick kids, cramming for an exam, etc.) Ideally, you’ll ship within 24 hours and to ship daily. The next to last step is to give potential buyers some final instructions and to set-up buyer requirements. These steps will help eliminate issues if a conflict arises with the buyer. You are not required to charge sales tax on cards you pull from packs as the sales tax has already been paid upon your initial purchase of the product. Set up a return policy. This instills confidence in the buyer and provides a backdrop for any ensuing dispute resolution process. When payment is expected (ie, no more than 48 hours after the auction's closing). Refunds are dependent on being compared to the original image to prevent someone from switching cards, (a practice often associated with unscrupulous vintage collectors), or other information pertinent to a potential buyer. Finally, after not selecting the below listing enhancements, (for the most part, they do not provide enough of a return on investment) you will review and submit your listing. Let's take a detailed look at the last sections you will see before submitting your item to be listed. 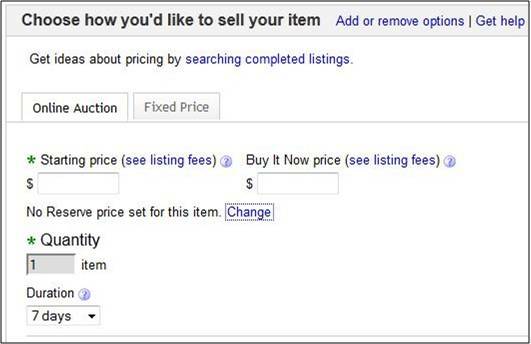 This is where eBay will suggest you do things that will make them money and cost you. Ignore them. Lastly, this is where you will see a breakout of listing fees and options to list, preview or edit your listing. Congratulations! You've just listed your first sports card on eBay. You might have noticed that we excluded some other options along the way like uploading more images and utilizing listing enhancements. As mentioned earlier, these have their place and the more cards you list you may eventually decide that some of them may be applicable to a particular listing. However, the background provided in this guide is more than enough to get you started. Hey Rob, I have a 1975 George Brett rookie card Gem listed for $8,200. Id that price compatible with where the market is now? Thanks. I have a question. I have a lot of Baseball, Football, Hocky, Basketball, Marvel Comic cards. I was wondering if you knew someone that could look up the value and post them for a percentage of the profits. Please met me know.